turbo reliability on track - Page 2 - Miata Turbo Forum - Boost cars, acquire cats. what is the sm record there? 1:32.686...anything lower is either ITA and/or on Hoosier R6 or A6. you don't have Inconell studs ? I think i may be under at the tracks Ive driven. I think you may be mistaking me for Sean? Ive only driven my silver miata around. I swapped to the v-band shortly after sav and hustler proved it to work. So, how do we find these records? A google search turned out a lot of times for me. I know vaguely of few Cali track SM record. I might be off by 1/2 second here. Cali speedway - not too sure on this one, but I believe it is 2:02s. I think Dean has the record for Infineon. can't remember off top of my head. I have no idea of Thunderhill. but I am sure if you look at winter's SCCA lap time with mylaps.com, fastest time probably or is very close to lap record. snowboarder - I did mistaken you for sean. I am very happy that Sav has taken turbo Miata to a new reliability level. no one will make fun of turbo track Miata any more. Ive never had a problem with being made fun of, once on the track. You just have to expect the ignorant GT3 or Z06 owner to scoff at you as they walk by in the paddock before the day starts. And I am crappy driver, I don't run much faster than those times you just posted up, defiantly not 10 sec faster but once you get out there and run I see nothing but surprise from everyone else. I wish I had video of my last session at NASA's Hallett event. It involved 4 people telling me to get out of the way or let everyone pass me on the grid comprised of Cobras, Vettes, a couple Vipers, and a couple CMC2 cars and I lapped every single car on the track. Where can we find out the spec miata records? The v-bands, bigger brakes, and real radiator are keeping me on track, without issues so far. I wish I was just getting into building a car so i didn't have to loose money with all the different setups i went through. What is really bad for me Is I think I’m getting better reliability out of a $250 craigslist motor than I was out of a $10,000 Built Motor by far and it really isn’t that much slower, I still think I’m right at 300 rwhp with it versus 350-360. That stuff never gets old. I've shown some pretty serious high powered track and race cars my tail lights on a number of occasions. Hustler, stop running with slow Viper/Corvette/Cobra crowds. this is from last Sunday event during Miata and S2K Challenge. at Buttonwillow #13 during 102F weather. SM record is 2:05 (in winter). 20 drivers below that. say you are the fastest SM driver, you will be dead last in advanced group. mid pack in high intermediate group. btw. 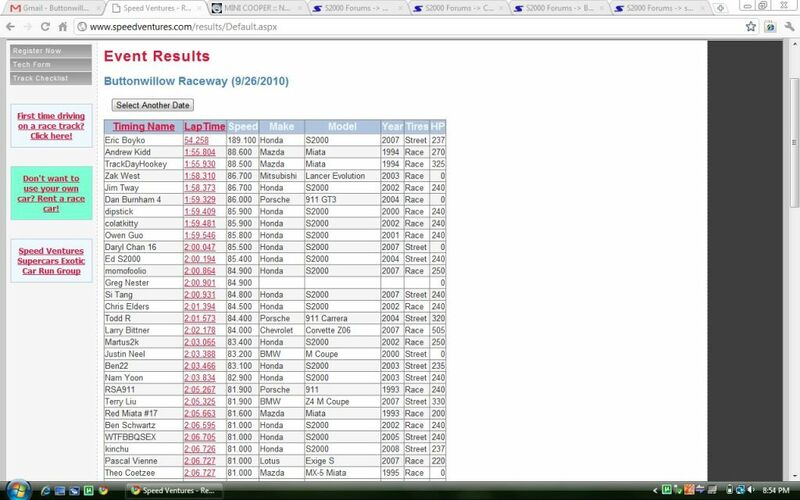 Sav got FTD, and Trackdayhookey (Rotrex) just 1/10 sec behind him. they both make roughly 350whp. Last edited by bellwilliam; 10-01-2010 at 01:40 PM. is it a combination of everything above ? or is it 2 of 3 ? Last edited by curly; 10-01-2010 at 09:45 PM. Inconel studs/v-bands are needed to solve the turbo falling off problem. You still need the "other stuff" to make sure the rest of the setup doesn't fail. For example, I have a turbo kit with inconel studs and my downpipe started self-destructing and leaving exhaust leaks after fixing the stud problem. I know I'm not the only one with this problem. V-bands solve the issue of the turbine housing detaching itself from the mani and cutting your sessions short. Then Inconel/monel/nimonic/unicorn-horn bolts safety wired with inconel wire to keep the CHRA from detaching itself from the turbine housing and necessitating a $500+ new CHRA. If you have a standard T25 flange, then inconel turbine:mani studs. Those are the reported solutions for the major issues people have had in the past. If you want to read more than that, there's a 60-something page thread about stud failures. Ok this is now a sticky, it is really good info. Keep it on topic, and add whatever you think is necessary. Both for keeping the turbo attached to the manifold, and keeping the rest of the engine from exploding after you do that. Are these failures only common after driving at some elite level? I know I have standard hardware, but have not broken anything yet. Yeah, they typically only show up if you're doing laptimes at or under the Spec Miata record for the track. At some tracks it will show up earlier than that. I had no issues for the first couple of days with my car, and once I started picking up speed it was an epidemic. VagaXT had no issues until he put a set of NT-01s on his MSM, and suddenly he was going 2-3 laps before they'd back out. I pulled a dumb move and didn't tighten the fitting on the oil return so I had to take it off at the track. I then, had to take it off again immediately because I didn't position the return properly...and did this all in under 1-hour thanks to the V-bands. Hustler: so how was the MC6 ? how did Matt Andrew do ? I know Savington is antsy to go head to head with him back in cali. Are you running stock rods at 300 rwhp now and no issues? Matt ran stupid fast in his only 2-sessions on that track. MC6? New Master? It was fine but the pedal dropped on the cool-down.